With the 4lazylegs dog carrier you can carry your dog easily and securely at all times. Thanks to the carrier, puppies and smaller dogs that may have problems walking can comfortably and safely be taken along anywhere you go. You can wear the 4lazylegs dog carrier on your belly or your hip. The carrier is suitable for all dog breeds up to 15 kg. The carrier is a strap that you can attach to your dog's collar or harness, so you can comfortably and safely take your dog anywhere you go. The dog carrier is made of strong cotton, and the drawstrings allow you to adjust the size. 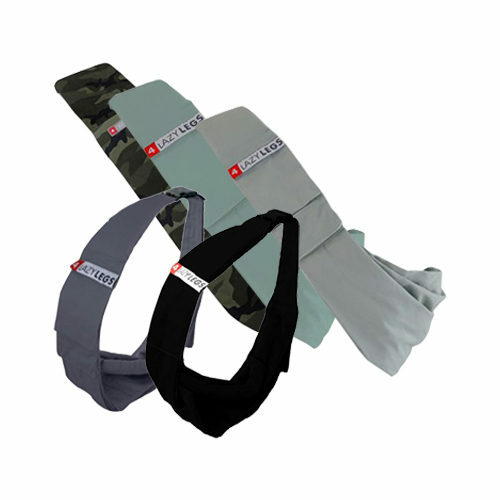 The adjustable shoulder portion is a soft shoulder pad made for optimal comfort for the wearer. The carrier can be washed at 40 degrees in the washing machine. The 4lazylegs dog carrier XS is 75% smaller than the regular size, ensuring the comfortable transportation of small dogs as well. Additionally, it has an extra pocket, which can be used to store poop bags or treats, for example. The carrier is suitable for all dog breeds up to 7 kilos. Basic: The carrier bag is made of water repellent polyester and is only available in black. Pocket Canvas: This carrier bag is made of durable cotton and has a useful extra pocket for poop bags or treats. Available in green, blue and grey. Have you used 4lazylegs Dog Carrier before? Let us know what you think about this product.